Intuitive design. Powerful insights. Productive reps.
Veeva extends its leadership with mobile innovations that provide users access to the right information faster than ever before. Veeva CRM’s adaptive design means sales reps and medical science liaisons benefit from a consistent and intuitive experience across all devices including laptops, tablets, and smartphones. 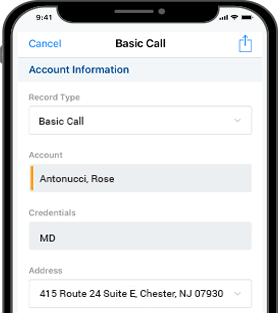 For the first time, field teams are empowered to be more productive while on the go, utilizing features such as real-time push notifications and MyInsights dashboards, all from the device of their choice. Explore our history of CRM innovation. Read how Sunrise enhances field mobility.